I, Darren Draper, do solemnly swear that I will never plague you with my thoughts on a daily basis ever again. Ever. I have chosen to defer all daily posting to Stephen Downes - who is certainly smarter, far better-read, and arguably better looking. For what it's worth, I'm in agreement with Dean Shareski. Commenting on others' posts is as important as writing your own posts. Resultingly, I will attempt to replicate Dean's recommended 2:1 CommPost ratio. P.S. Have you at least learned a thing to three along the way? I know that I have! Who's Afraid of the Digital Natives? Reading Will Richardson's recent post has caused me to think more about today's students (aka those pesky Digital Natives). In his post, Will asks a series of very important questions. In my opinion, it is crucial that these questions are answered by those of us that understand the positive benefits of mobile educational technologies before these (and similar) questions are answered by ignorant lawmakers and policymakers - thus forcing us to live with the decisions that are made. As a result, in this post I will attempt to set forth a few answers from my point of view and encourage you to do the same. Hopefully together we can arrive at a general consensus. To preface his "Rhetorical-Question-A-Rama", Will identifies and discusses the tech habits of a very savvy 14-year-old student from South Korea. Apparently, this student, not unlike many American students, is constantly connected to his network when not in school. During school, this student has also learned to access his network through his mobile phone - while his phone is still tucked away nicely in his pocket. While Will (and subsequent comment writers) seemed very surprised by this student's ability to blindly send text messages to members of his network, I'm not surprised at all. I've known students for years that have had this ability. Yes, here in the States. Even in little ol' Utah. In fact, many of these students were in my own classes. In order to catch up to the current state of things: Arthus, if you're listening, how many kids do you know that can text without looking? In response to this and similar behaviors that I have witnessed in the lives of our students I began, several months ago, to sound the cry for teachers everywhere to Pay Attention! Obviously, we still have a long way to go. It seems to me that Will, of all people, should know that this "version of the future" is now. It's happening and has happened for quite some time. In fact, it's very much the kind of "now" that he and Ian and David and Marc and all of the other "thinkers in educational technology" have been describing during the last five years. Personally, I like David Warlick's description of tentacles - when we separate our students from their network, it can very much be compared to chopping off an appendage. As for what "we as educators... should be thinking"? Yes. We should all be thinking. And now. 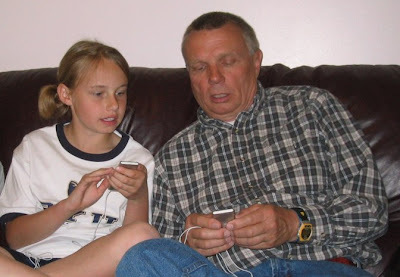 Do we clamp down harder on the technologies our kids use? Try to penalize, even criminalize their use? Keep pretending that there are no acceptable uses of phones or other connection tools? These are really good questions (actually all inter-related), the answers to which really lie in how we define the purpose of education. Personally, I think that the heart of the purpose in educating our youth lies in preparing them for the future. I think that many people would also agree with such a purpose: We educate our kids to prepare them for the future - even if we don't yet realize what that future entails. Now, if the purpose of education is mainly to prepare our students for their future, a time when they are presumably adults, are we doing them any service by not letting them use the tools and techniques that present-day adults use in learning? When an adult (in or out of the workforce) needs to learn something, do they not tend to have access to their network? The last time you had something to learn, what did you do to learn it? People everywhere (except in some schools, churches, and prisons that prohibit such behavior) can find ways to connect to their network. They've got Google in their pockets, they've got their social networks, and from each they learn - because their businesses depend on it, because they've come to expect it, and because we've come to expect it from them. Hence, even as adults, we've become dependent upon our networks. Why should we expect any less of our students? Rather than fearing the capabilities of such incredibly talented Digital Natives, I think it's high time we respect what they can do, encourage their development, and stop limiting their potential. I know, I know: Much easier said than done. Nevertheless, these kids are only as "dangerous" as we let them be. If we allow them to use their networks while working on schoolwork, what will they gain from hiding such access? Or do we start thinking about changing what we do and how we do it? There's a reason Jakes has said this, you know. David Jakes, like many of our students alike, has realized that in far too many cases, our students are learning more out of school than they are in. And that fact is just not right. Should open phone tests be ok? Should we embed the information and connection skills that the student in the story has into our own curricula? Absolutely. I don't think we can turn back any longer. Or rather, I don't think we should turn back. The kinds of "tests" that are administered to adults on a daily basis are open phone, open network. Why not prepare our students for adult-life. Why not prepare them for reality? Oh, and by the way, who taught Insoo to do the things he’s doing, do you think? Who's teaching whom (no offense, dad)? I anxiously await the answers you're now prepared to offer - because if we don't figure out the answers to these and other related questions, who will? I've been thinking a lot about Wikipedia lately. Open. Free. And while many of today's "progressive" educational thinkers tout it's accuracy and ability to report on even long-tail type topics, I'm very surprised by what I don't find there. Question: Why can I find a Wikipedia entry for only a few of the many prominent leaders in educational technology? 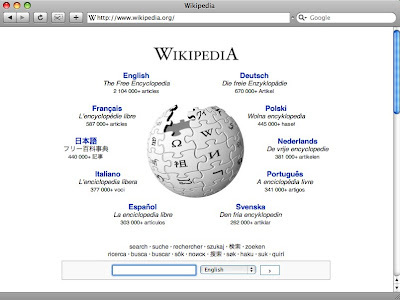 Now, I know that anybody can add an entry in Wikipedia - but only those deemed worthy by the community actually stick. Therefore, why the preferential treatment? There were also several others (like Andy Carvin and David Pogue) that should probably be lumped into the ed-tech crowd, but would probably attribute their Wikipedia entry to some other higher-profile achievement. Andy, for example, is with NPR and David is with the New York Times. Karl Fisch - Surely Shift Happens (seen by more than 10 million people) deserves a place among the Wikipedia immortal. 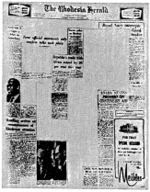 Marc Prensky - There is an entry, Digital native, which mentions that "Prensky claims to have coined the term...", but no link detailing more information about Prensky and his accomplishments. On a personal note, I was also surprised that David Wiley (professor at Utah State) had an entry, but none of his USU supervisors had made the cut - not even the dean of his department. To make things worse, Stew Morrill (head basketball coach at USU) and Brent Guy (head USU football coach, 2-10 record as of November 24) each have entries - but then again, we all know that athletics are far more important than academics. I guess it's time to vote. Again. 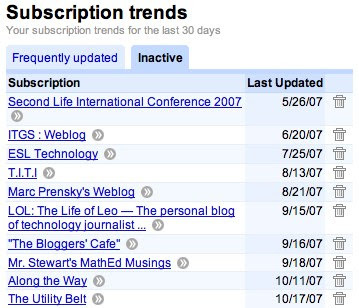 The 2007 Edublog Awards finalists are listed below (as posted here). If you choose not to vote, you'd at least do well to browse through this year's list of finalists - quite an extensive list of quality blogs, if I do say so myself. And I do say so myself. Who nominated the blogs, anyway? Were most of the blogs nominated by their creators? If so, what good is that? Given that anybody could vote for a blog multiple times, what kind of effect would the Twitter army have on such a poll? I chose to vote three different times it was so much fun (juuuuust kiddddddinggggg). On a positive note, it's refreshing to see that so many quality educators out there are actually paying attention. Great stuff. Don't forget to vote. I love golf. Yes, I play - if you choose to call what I do on the course 'play' - but I also think golf is unique among spectator sports. How many other athletic events do you know of that allow spectators to literally walk within feet of their favorite stars? 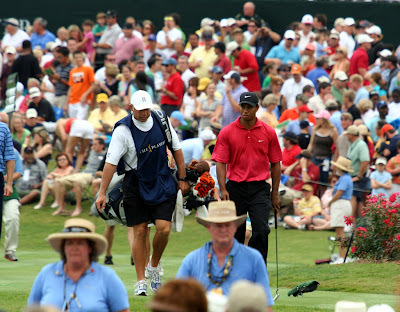 Yes, fans of all ages are welcome to pay the fare, walk the course, and literally listen to Tiger sweat as he smashes the ball farther than humanly possible. Meanwhile, the remaining privileged are left wondering, "What did that moron do to rattle Tiger's cage?" As it turns out, ed-tech, while hopefully not a spectator's sport, is actually exactly like golf. In our field, if we play our cards right from the outset, we're literally able to rub shoulders with many of the great ones - think: NECC and other conferences, EduBloggerCon, and even (at times) Twitter. I am extremely grateful for the many interactions I've been able to have with many I consider to be ed-tech stars. It must be remembered, however, that there are definite lines that should not be crossed, behaviors that are not acceptable, and actions that will do little more than rattle the tiger's cage - even (and especially) in relation to our interactions with others - regardless of their apparent status on our personal Greatness Meter. And Twitter is no exception. I think that Jennifer Wagner's timely post about her Twitter confusion sums up the feelings of many of us out there. Twitter, while still in its infantile stages, can admittedly be a little confusing. At times one can feel so close to other network members - and yet betrayed (or fooled) by the shallowness of those minuscule 140 characters. I guess I feel for David Jakes the most. His tweets have highlighted my Twitter experience and his notable recent drop-off has left me hungering for a plate of Pot Roast Nachos. So @djakes, if there's anything that I've ever said or done to offend you in our Twitterspondence, I apologize now. You're a definite ed-tech star in my book, one of the great thinkers of our time, and one of the few great ones that I know who has actually been willing to mingle with the minions (this list highlights a few others, some willing, some - probably understandably - not). Deal with the morons one at a time. Be swift and sharp in your punishment (The block feature in Twitter & Skype may prove effective). Follow all punishments with an increase in love - extremely important. And get back in the game - you're two strokes in the lead and it's still your turn. Please think before you act. Be considerate of others' space. And never forget that the person on the other end of that tweet is real. I have really enjoyed catching up on old Ted Conference presentations during the drive home. The presentation that has recently moved me most was a 2004 performance by the 14-year old Jennifer Lin. The improvisation segment of her performance - shown below - literally brought me to tears (I know, what a sap) because the music she apparently creates on-the-spot is absolutely amazing. Equally amazing, I think, are the countless improv-type performances made by teachers around the world on a daily (and sometimes hourly) basis. I know there are times when I'm forced to "make it up as I go" and have always believed that some of the best teachers are simply one step ahead of the kids. 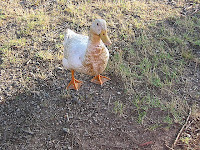 If you follow only one link from this blog in your life, let it be [this one]. 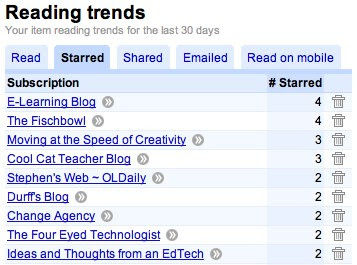 I've thinned my aggregator lately - and learned a few things a long the way. Yes, I read, star, and share many items - but never email. I guess it's just that email is so 1997. In case you were wondering, stars indicate that I just might write about it, while shared posts are listed on my blog (right side, 3/4 of the way down). Similarly, every non-commercial educational technology blog that I read is also displayed - drop me a line if you'd also like to be a part of my personal learning network. In the near future I plan to thin my blogroll further - incorporating multiple levels of recommendation. 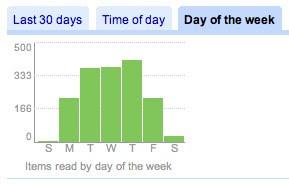 I read more on Thursdays, and very rarely on weekends - in fact, I usually try to begin my week unplugged (I know, backwards man that I am). 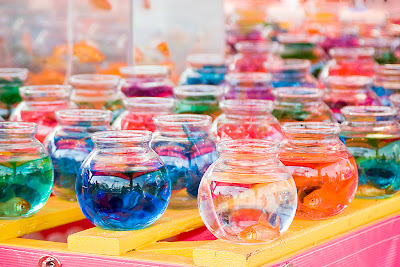 I have found that when it comes to creative thinking, absence makes the heart grow fonder. In other words, if I can give myself a break from technology for a brief period of time, my mind returns to the scene invigorated. ... But believe that the only good blog is one that is updated frequently. Yes, Marc, update soon because your blog's on the chopping block. The Partnership for 21st Century Skills is arguably the leading advocacy organization focused on infusing 21st century skills into education. The organization has brought together various businesses, educational leaders, and policymakers to define what I believe to be an accurate vision for 21st century education. To assist teachers in learning more about 21st century skills (and how to teach them), the partnership has also developed the recently released and highly interactive Route 21 website. I found myself able to easily lose myself in their site - amazed at the breadth of information available to educators. According to the framework developed by the partnership, there are fifteen key traits identified as the skills, knowledge and expertise students should master in order to succeed in work and life in the 21st century - traits which, I believe, every teacher should attempt to address in their curriculum. As I have yet seen all fifteen skills briefly defined in one location, I thought it would be helpful (even if for only myself) to provide a short definition of each of the skills below. All definitions and images in this post have come from various locations on their website. If you would like to learn more about the above skills (as well as gain access to related resources), I highly recommend both the Route 21 website and accompanying 24-page white paper. In reflecting on the fortunate circumstances in which I find myself, I am thankful for many things. This list is neither comprehensive nor (except for the first two) presented in any particular order. First and foremost, I am extremely thankful for my wife. Any accomplishments I may have experienced truly pale in comparison to what she has done for our family. Along with my wife, I would be amiss if I also didn't express gratitude for my healthy children. While life seemed much simpler before having children, I never would have guessed that so much could be learned from people so small. Lest I'm accused of ignoring the scope of this blog, I will continue my list of thanks confessing gratitude for my job. As a Curriculum Technology Specialist, I really couldn't ask for a better job at this point in my life. What's not to like about education, technology, and the flexibility to get the job done? Because of these words, I can truly express thanks for the privilege of worshiping Almighty God according to the dictates of my own conscience. Thankfully, I can also allow all people the same privilege: Let them worship how, where, or what they may. To continue, if it weren't for these words then we, as a blogging community would be forced to unduly restrain ourselves in the expression of our opinions. Unfortunately I don't think that we, as a nation, truly appreciate the freedoms of speech and press of which (1) so few in our world candidly benefit, and (2) for which so many of our ancestors have given their lives. May we all take time to be grateful for what we have. If you are among those that can claim the freedom of speech, then you too should be grateful - for censorship is sadly commonplace in many countries throughout our world. Next, I'm thankful to be alive during this, the most exciting period in the history of the world. I wouldn't want it any other way. You know, I'm thankful for a warm house, a comfortable bed, a microwave oven, indoor plumbing, a refrigerator, and my 21" television: all comforts of life that are now deemed necessities, but that just four generations ago were largely unheard of. I am extremely grateful for the many opportunities I have had to obtain an education. I have truly been fortunate in my quest to take the road less traveled. I owe my wife and her parents immeasurably for their support along the way. Speaking of parents, I'm very thankful for my own. I wouldn't be here without them, you know. Honestly, though, the selflessness they have demonstrated to me and my siblings has been and will continue to be an inspiration to me for my entire life. Speaking of education, I'm thankful for my statistics class (Utah State University, graduate class). I never realized how similar I am to the students that I once taught as a math teacher. "When am I ever going to use this?" and "Who in the world took the time to come up with this?" are common thoughts that enter my mind. I am thankful to be able to enjoy good health myself. For example, I recently learned that I have my first cavity in 16 years. Not a bad run, if I do say so myself. On to ed-tech. I'm thankful that there exists such a field in the first place (thirty years ago, there was nary the concept). Even though I'm comfortable working in the Windows and Ubuntu environments, I'm very grateful for Mac OS X. Tiger and Leopard have made it so I'm able to focus entirely on getting work done using the computer - rather than spending so much time in getting the computer to function, so that I can begin to get work done. In fairness, I've had also had a great experience in using Ubuntu - for which I am equally thankful. I'm thankful for the experiences I've had in working with the EduBloggerWorld community. Even though the social network itself might be considered less than a success, I cherish the relationships that have been established through initial connections to EduBloggerWorld. Speaking of networks, as weird as this sounds, I'm also thankful for my Twitter network. This network has become an indispensable personal learning network for me and several of my colleagues. As I think of my personal learning network, I find it hard to not think about some of the many experiences I have had as a result of such connections. Thus, I'm thankful for Robin, Sue, Durff, Patrick, Kristen, Stephanie, John, Simon, Craig, Emily, Lisa, Ken, Gabriella, Dave, Charlene, Cathy, and all of the other Social Software '07 participants in my first attempt at "Open Professional Development." I'm thankful for Jerry Seinfeld and Ray Romano. Their television shows, as shallow as they may be, have been the source of much laughter in my life. It has been said that I possess the qualities of Jerry, George, Kramer, and Raymond - all wrapped up in one. 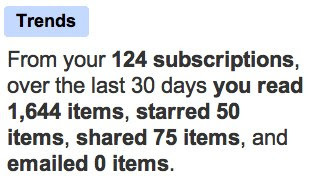 This may sound strange, but I'm thankful for Skitch. The combination of screen-shots + easy posting to the web have made this application (still in beta) one of my must-haves. I'm thankful for a car that's reliable and a mini-van that's roomy to drive around the troops - without either of these vehicles, my life would be much more noisy, my commute would be much less enjoyable, and my family would probably experience much more friction. To travel in comfort is a definite blessing. Wow, I can't believe this one didn't come earlier. 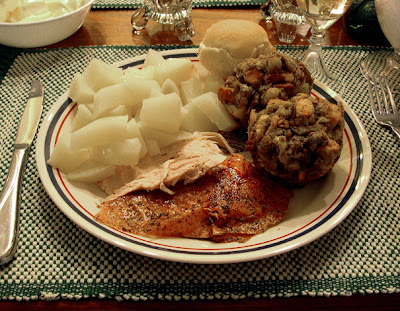 I'm thankful for three square meals a day - or a comfortable equivalent. To be honest, I generally only eat two real "meals" per day (I usually skip breakfast. I know, so sue me) - but have never had to go hungry for an extended period of time. As I think of the large percentage of our world's population that can't claim this benefit, I am truly humbled and feel extremely grateful. I'm thankful to live on such an amazing planet. It's beautiful, big, and small at the same time. I'm thankful that Google has made IMAP available to its Gmail users. This feature alone should add three years to my life - time added because it was never lost in deleting multiple copies of email messages. I'm thankful for symmetry in nature. 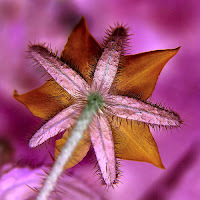 There are very few things more beautiful than a brightly colored, fully symmetrical flower. I am truly grateful the Creative Commons. Sharing has never been easier. 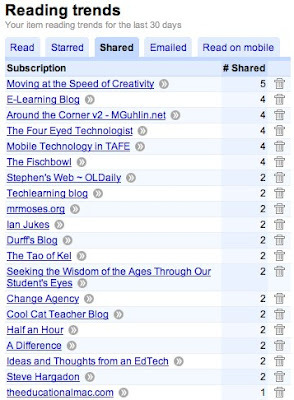 Speaking of sharing, I'm thankful for the many websites that make sharing possible: Flickr, Google, YouTube, TeacherTube, and Del.icio.us are just the beginning. Speaking of websites, I'm extremely thankful for the Internet. What would life be like without such simple connectivity? Oh yeah: All life B.G. and huge portions of our planet today. I will always be thankful for Bob Sproul: the first boss I ever had that truly believed in me. I was hired before I even interviewed and given complete trust in achieving all that I wanted to accomplish. Speaking of trust, I'm also grateful for the trust afforded me by my current supervisors. Without such trust, I would never be able to do what I do best (and no, I'm still not sure what that is yet). I'm thankful to be the oldest of seven children. I hated having a large family while growing up, but have loved it ever since. I am very thankful for three simple words that, when combined, provide a refreshing formula for prioritizing: good, better, best. Let's face it: When good things take precedence over things which are better, that which is good becomes evil. Finally, I'm thankful to have been able to take a little time to be thankful. Little puts life back into perspective better than creating a list of thanks. 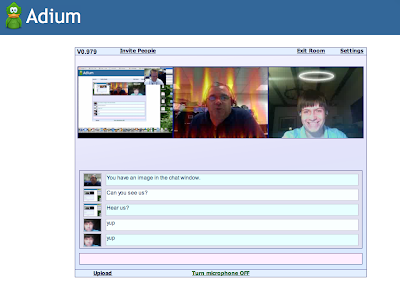 I enjoyed "hanging out" with you the other day as we explored CamTwist using Adium's new video chat functionality. Furthermore, I think that the contributions in thought and discussion that you (and students similar to you) are adding to the blogosphere and other educational forums are profitable and extremely valuable, as you add a unique perspective that very few people can replicate. While I don't think that most of today's kids are like you, I do think that you are "representative of the kind of independent, engaged, proactive, and self-directed learner who will thrive in the flattened and connected world of the Internet." Hence, thanks for your willingness to contribute and participate in the ed-tech community. You have certainly added a nice touch to my personal learning network and I will continue watch your career dedicated interest. Nevertheless, the "responsible adult" in me (I know, it rarely glares it's ugly head) feels an intense need to extend one brief word of caution. I shall do it in the form of a story. 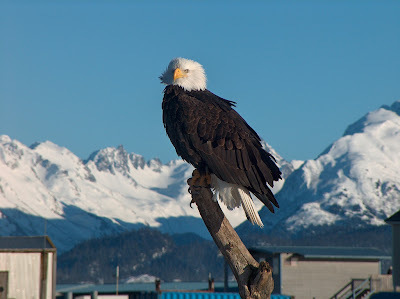 Last summer my brother-in-law, having achieved some form of success in his budding career as a dentist, decided to take his father, father-in-law, and nine-year-old son on a "dream trip" to Alaska: a kind of once-in-a-lifetime fathers and sons get-away, if you will. And so it was as they fished, explored, and lived "high on the hog" for several days together in the beautiful backwoods of Alaska. Upon their return, the youngest in the group (my nephew) was asked about his favorite part of the whole trip. "What did you like most about your trip to Alaska," went the inquiry. "Harry Potter and the Deathly Hollows," was his reply. You see, my nephew was allowed to purchase the book during their trip and amazingly managed to read nearly all of it while touring Alaska. Do you think that the money spent on my nephew's trip to Alaska was well-spent? 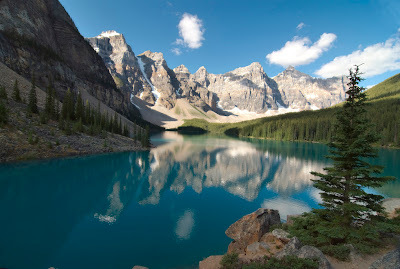 Do you think that my brother-in-law will ever be able to "out-do" a trip like this - in the eyes of his son? Having already encountered this "once-in-a-lifetime" experience at such a young age, what's next? Will you (or my nephew) ever find satisfaction in future adventures - especially if they prove to be less engaging than what you have already encountered? Would you be better served in focusing on other things at this point in your journey, rather than on things that may, at first glance, appear to possess more magic? To be honest, I don't know the answers to these questions (if, indeed, there are correct answers). Furthermore, it may well be - and I can only hope - that your experiences today simply lead you toward bigger and better adventures in the future. That said, I also hope that (A) you never run out of steam, and (2) you aren't forced into a mid-life crisis at the age of 19. I have to admit that I'm a little disappointed in you. 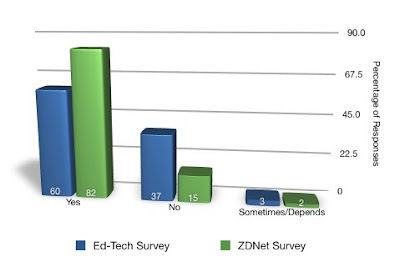 A little over a week ago, I posted the results of the Media Ethics survey that I conducted (and compared) in connection with the ZDNet survey created by Ed Bott. While I realize that there were no extreme shockers in the results I displayed, not one person has commented on the post or found any interesting in the comparison I made. Only you can change that trend. Ed-techies are more ethical than the Techies. 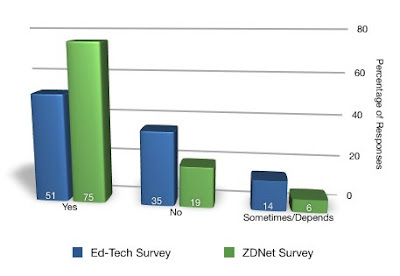 It's no surprise that the Ed-techies appeared, question for question, more ethical than the techies that took the ZDNet survey. Although my students might argue to the contrary, I've maintained all along that teachers are a pretty good bunch, generally friendly, and by and large more honest than the average Joe. Ed-techies are nearly 2.5 times as likely (than your run-of-the-mill Techie) to NOT strip the DRM out of DRM-protected audio or video in order to make a back up copy. If you buy a DRM-protected track from an online music or video store like iTunes, is it proper to strip the DRM and make an unprotected backup copy? This is clearly because (1) most teachers don't even know what DRM is, or (2) even if they do know what DRM is, they don't have a clue about how to strip it out of the content. The only other explanation would have to that (3) teachers don't make back up copies of their data - and we all know that's surely not the case. There's a 50% greater chance that a Techie will use BitTorrent to download their missed TV shows over an Ed-techie. If you miss an episode of your favorite TV program from a broadcast network, is it OK to download it from BitTorrent or a file-sharing network? Granted, 99% of the content that is transfered via BitTorrent is probably pirated material. Nevertheless, there are actually legitimate uses for not blocking the pesky little torrent packets that are flying through your district router. When I taught video productions, we used BitTorrent to transfer large video files from machine to machine (and and from room to room). Legitimately, I can envision students from the Flat Classroom Project using BitTorrent to share files with each other (country to country, for that matter). Furthermore, even though I have yet to hear likewise from other sources, one of our district network technicians swears that YouTube packets look exactly like BitTorrent packets - yes, even to the trained eye. Possible implications? (1) YouTube doesn't have high bandwidth costs because it distributes it's content via a torrent-like system and (2) when Johnny is watching Lonelygirl15's latest episode on YouTube, the district network watchdogs actually think he's downloading a pirated copy of Photoshop. Hmmmmm. Then again, we all know that never happens, either. If I Don't Effectuate Change, Who Will? The words of Dennis Richards haunted me over the weekend. Not haunt as in Ichabod Crane, but more haunt as in Pay Attention to your own message, you moron. And no, Dennis would never call me a moron - he's far too tactful. What he did tell me, however, is that we (as teachers) don't always get what we want - rather, it's best to focus on what we need. He also shared with me a few of the things that his district is doing to move forward. Instead of originally heeding his advice, however, I hesitantly admit that I have worried more about maintaining status quo than in actually doing what's best for the kids. I guess it's just too easy to be lulled into TTWWADI: "That's the way we've always done it!" After being told over and over that the technology department in our district is merely considered an "add-on" to other departments, I actually started to believe it myself. And that, in spite of David Jakes' emphasis that technology, at this point of the game, is no longer something that is integrated into our teaching but rather integral to both our teaching and to our students' learning. As Karl Fisch has stated, it's not like these technologies (like wireless networking) are a luxury anymore. In all sincerity, our students need us (as teachers) to use technology in our teaching because their century demands it. Thank you Dennis, David, and Karl, for leading the way. Yes, technology is integral. Yes, our century demands it. Yes, our students need it. And you know, if I'm not the one that attempts to change our schools for the better, who will? 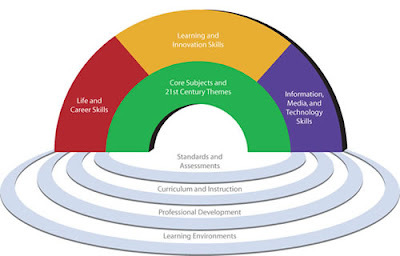 The Partnership for 21st Century Skills identifies the following traits as the skills, knowledge and expertise students should master in order to succeed in work and life in the 21st century. 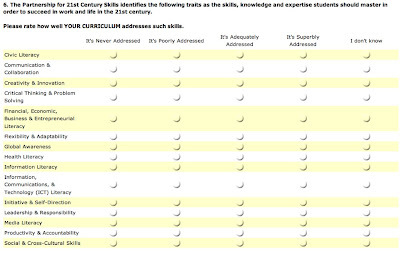 Please rate how well YOUR CURRICULUM addresses such skills. I then list each of the fifteen skills identified by the Partnership for 21st Century Skills and provide a way for teachers to rate how well they address each skill. I now think that this question actually forms the keystone of my survey. While I still want to know what the teachers I teach actually want to learn, it's also critical that I ascertain how well they are addressing the needs of their students. If teachers aren't teaching what students need to learn, then all that we've done is for naught. Granted, creativity can cause irreverence and sharing may come at a price, but isn't it time to once again employ the kind of sense that was once common? I've been asked to conduct a needs assessment to identify the kinds of trainings I should do in one of the schools in my district. In creating the survey, I've run into one key issue: Do we really want to know what our teachers need or do we really need to know what they want? Personally, I think we need to first find out what our teachers want, only to structure your offerings toward something that they actually need. Several members of my network responded quickly, with thoughtfully crafted responses (+10 pts to them all). I present them to you now, in reverse chronological order, in order to best reply back. 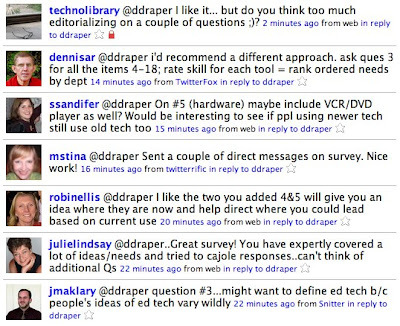 @jmaklary - How would you define educational technology, keeping in mind that you want to keep the survey as short as possible? @julielindsay - Thanks. I'm not so sure about "expertly", but I hope it gets the job done. @robinellis - I agree. After asking what they currently use, I feel better about asking what the teachers want. @ssandifer - Agreed and added. I was hesitant at first because I don't want people to get too confident in their use of ed-tech use simply because they know how to push play on the VCR. @dennisar - You've really got me thinking. Originally I had intended on following the approach you've suggested. I'll think more on it and perhaps change adopt your suggestion. @technolibrary - Perhaps, yes. I've reworded one question. What suggestions would you make? @mstina - The principals requested that the name be a required field. And yes, the last question is a bit complicated. I might delete it altogether. @robinellis - I agree completely. As professional devopers, we're weaving and stretching on a constant basis. @technolibrary - Thanks. Typo fixed, and of course you may borrow it. As the survey has evolved as a result of the feedback I have received, I also welcome your feedback. By the way, how do non-connected teachers even function without a network? I'm trying to help teachers establish a web presence. Can you please help me finish this statement? "A teacher without a website is like..."
Today I had to opportunity to learn from Alan Kaschub, music professor from the University of Southern Maine. He gave us a quick tour of Apple's GarageBand application, while discussing with us how he uses it to teach music. The music class of today is very different. Kids don't need to bring their own instruments any more. 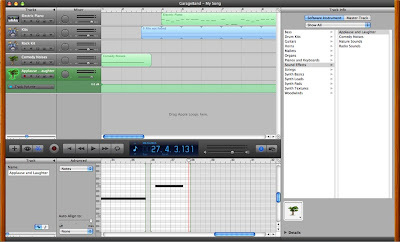 With computer applications like GarageBand and Finale Notepad, they can learn composition and music theory without spending money on the actual instruments. Apparently, it helps when even music teachers pay attention. Last week I had the opportunity of instructing a group of accountants (and other financial officers from around the state) in connection with the Utah Association of School Business Officials. In the training we discussed basic presentation design guidelines along with an extensive overview of the many features now available in Microsoft PowerPoint 2007. At this point in my career (and the life of presentation software such as PowerPoint), I think it is vital to teach effective design along with the basics "how-tos" related to the software itself. Yes, it will be the right-brainers, the artsy-types that will be able to reach their students/participants/audience best. Thus, I began the training with this presentation, primarily based upon Thomas Cunningham's article Avoiding Seven Deadly Multimedia Design And Presentation Sins.